What Do Parents Have to Say About Sky Kids? This is truly an amazing camp! Each week is focused on a new concept which then is integrated into projects and field trips. In addition to this, they frequent parks, beaches, The Exploratorium, museums, etc.! Yes, there is an hour or so of Mandarin but newbies are welcome. The teachers and staff are attentive and welcoming. My 6 year old loves this camp and can't wait till next year. Both my 7 year old girl and 9 year old boy attended Sky Kids this summer for the first time. My boy knows some mandarin and my girl is a beginner. They both LOVED Sky Kids. This is saying a lot, because my boy has never said he liked a camp and we've tried several. He did Innovation for a week (loved it) and Nature for a week (loved it!!). He's a gamer and that he enjoyed being outside running around says a lot about the camp counselors. It's a very warm, engaging & active camp. I would highly recommend it! And, we'll be baaaaaack!!!! My daughter attended Sky Kids last summer and had a blast. For us, Mandarin was the initial draw, but we quickly realized it wasn't the only thing this camp had to offer. Sky Kids is fun educational, and very well organized. Every day was a new adventure, with outings that got the kids outside and moving around. We will be signing her up again this year! This is our first year at Sky Kids and our three daughters are really enjoying themselves!!! Our three daughters are in the Mandarin Immersion program at Starr King Elementary. We have tried several different Mandarin language camps and so far they have loved this one the best. Finally a camp to supplement their Mandarin and allow them to be outside, go on cool field trips, do sports, art and science - all the things we wanted in a summer camp. Our daughters really love the camp counselors as well. And as a family that believes in public transit my favorite part of the camp is they take public buses to all their filed trips - very environmentally responsible! We will definitely send our three daughters back next summer and look forward to possible summer exchanges with the incoming Chinese students as well as our girls get older. Sky Kids Summer Camp has been an amazing experience for me as parent. I was not able to accompany my daughter during the trip to US but all my concerns were resolved with great help from the Sky Kids team. They were awesome in helping with all the logistics and host families. And I was all the time updated via email, wechat and iCloud to share some of my daughter’s fun time. My daughter had a great time there with both teachers and host families, and made some new friends, too. Harry only wants to go to Sky Kids next summer! 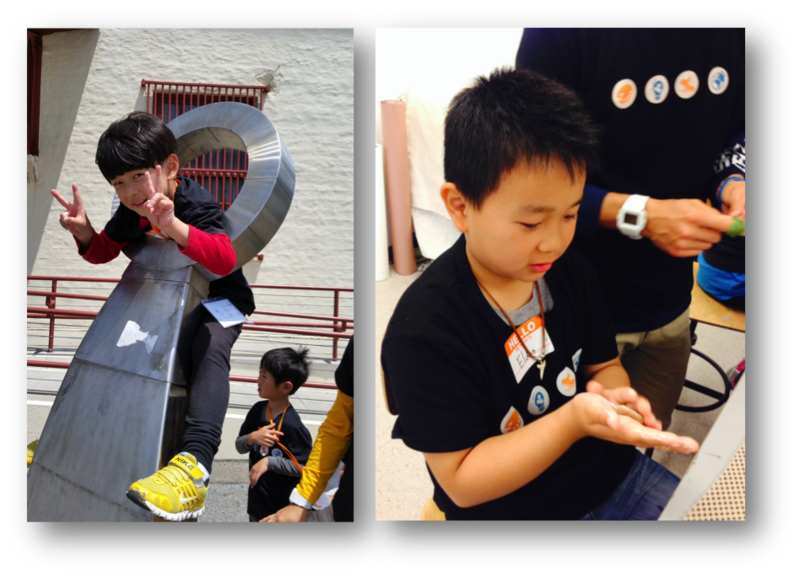 Both Harry and Eldon really enjoyed their 1 month in San Francisco with Sky Kids. They miss the American lifestyle. This summer I brought my children on holidays to the US and our first stop was San Francisco at the Sky Kids Camp. Even though my kids only attended camp for one week, they left with lots of wonderful memories. Every day they played and learned with kids from different nationalities. After only 3 days, the results were surprisingly fast: Angela came home and spoke English to me. During their camp days, both Michael and Angela made many new friends and enjoyed being out everyday on field trips, to museums, travelling by public transportation. They also made a group movie with their fellow campers, which was recorded on a DVD for us to take home. What a great idea because my kids brought it into class to share with their Shanghai teacher and classmates. 5 days was too short. They cried when they had to leave on Friday. If we have more time next year, my children would definitely want to spend more time at Sky Kids Camp! Copyright © 2013-2019 Sky Kids. All Rights Reserved.